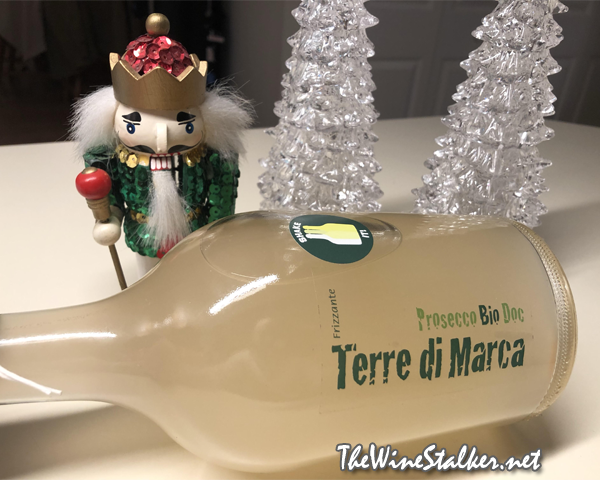 The “Sur lie” wines are produced the way the Italian ancestors made Prosecco (or sparkling wine, really), including the bottle enclosure tied with string. They’re both unfiltered and undergoes a natural second fermentation (carbonation) in each individual bottle. Prosecco today is filtered and sees second fermentation in large pressurized stainless steel tanks. The Prosecco “Sur lie” Frizzante is made from 100% Glera on limestone soil, has a 10.5% ABV, and 0 grams of residual sugar. The wine is hazy, its color like freshly squeezed lime juice. The nose is yeasty with aromas of limes, spiced apple, and spiced pears. On the palate the frizzante (lightly carbonated) gives it a nice airy mouthfeel on its medium body. The acidity is bright, which accentuates the lime flavor over its buddies apple and pear. Then it finishes juicy and refreshing. I like that this is nothing like your average Prosecco. I like that it’s almost like drinking some juice concoction with lime as the headliner, both on the eyes and on the palate. It would even be good as a cocktail if you add some vodka. Just like the Rosé “Sur lie” Frizzante, it doesn’t look like this is being sold in United States right now. But it’s sold for roughly $13 in the European Union, so I’m running with that. And I’m going to give it a recommendation, not just because it’s good, but because I also am a big supporter of trying different things.